Claim 18 below is representative. ranking the listings … based at least in part on the respective dwell time …. PROBLEM — Although there is probably a way to salvage this invention on eligibility grounds, the PTAB is clearly wrong that “DWELL TIME” is an internet specific phenom. Apparently, none of these PTAB judges have worked in retail sales. I’ll note here that the chart above is described as follows: “FIG. 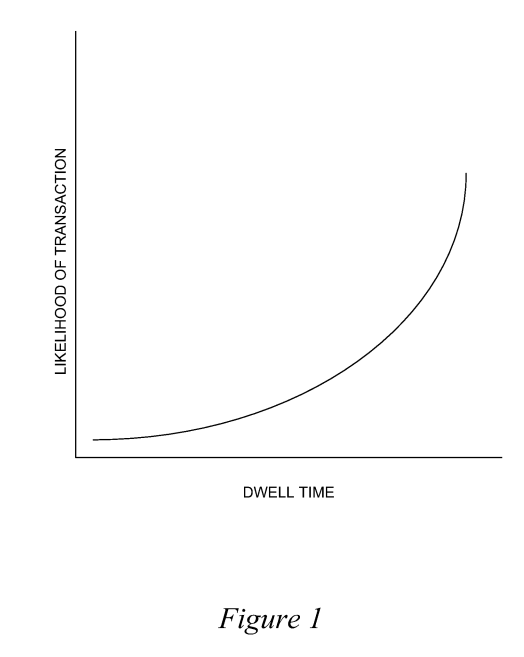 1 is a graph of a likelihood of a transaction occurring based on dwell time at a ‘view item’ page.” This chart appears fairly problematic in this case if – as I suspect – the chart is actually a prophetic example – even though not identified as such. Not a huge deal – except that the entire patent turns on the function of “dwell time.” If I were prosecuting this patent, I would make sure the PTO is made aware of the source of data (or absence thereof) for forming this figure). I’ve been predicting now for years that this would start. Cases like Alice illustrate that we need radical change. We should start with dissolving the CAFC to rid it of the Google stacked appointments from Obama. It could then be reformed. The academics that haven’t been bought off should get some backbone and stand up to the justices against judicial activism in cases like Alice. How do you determine which ones those are? The same way that you determined that M@ngo H@irb@ll couldn’t be “bought off”? MM–again you play the game of zero memory. Remember the article about Google buying off the academics? Remember that detailed study that was the work of many hours of investigative reporting? Otherwise known as the Internet Style of Shouting Down. Or, the age old propaganda move of repeat a L 1 E often enough, and some will believe it. All in all, this is one type of Malcolm blight that has been around like forever. He does not engage on the substantive counterpoint, then repeats his first monologue as if no counterpoint was ever presented. This tendency was highlighted in the days of the temporary “Let’s have a nice ecosystem” DISQUS posting era. That is, until that tendency was noted (by yours truly), and only then did Malcolm opt for the highest level of “security” in the DISQUS system that stopped compiling all of his trite scripts. The qq-ing that you are seeing is for a different reason (quite aside from your predictions). I generally agree Anon, but I think it is magnified because of opinions like Alice. Also, I think this is just how it could get started. What I think is that we are in a modern era where we aren’t du mmies and we know what these people are up to. The political change is just highlighting all this. Alice gonna be five years old next summer. Ain’t going anywhere. Still a total roll of the dice. Still nonsense from all corners on the wee problem with information inventions. Would you care to explain to everyone why you disagree? You must have thought about that for a few minutes. I hope. The software industry is subject to the same considerations for why patents are useful in other industries – useful to society, mind you, not just those industries. Absent patents as an incentive for public disclosure, technology gets kept secret or wrapped up in burdensome contracts. We saw an example of this a few years back with licensing contracts on AutoCAD. It is far better, particularly for such a huge worldwide industry, that patents be possible, to continue encouraging publishing of functional specifications, whitepapers, source code, or other disclosures. Congress never intended to make logic processes applied to data eligible for patenting. That would have been a wildly radical change in the law. Congress recently amended the patent act and did nothing to abolish software patents. That is evidence of their intent. Even before that, they included provisions for business method patents, which are “logic processes applied to data”. That’s also evidence of their intent. Show me Congress abolishing software patents, Mal, and then you can say that it’s a wildly radical change in the law. Finjan v. Blue Coat. That took less than a second. (2) starting from the fundamental unambiguous and non-controversial principles of eligibility case law, why is that claim going to be found eligible, 9-0, by the Supreme Court? As long as Thomas is on the court, nothing can be certain about patents. Also, just a word of advice: step up the game, iDan. You’re in over your head. Probably an agent practicing in the software arts for a few years? Here’s the good news: the k00l-aid stains will wash out. The bad news is that I have long memory and I save everything. Please don’t be your usual self, Mal. That’s the type of behavior that make people no longer want to talk with you. You may have a long memory, but other people do too. There’s a reason that your posts are infamous throughout the IP sphere, and it’s not because anyone respects them or you. And Dennis, this is the type of behavior that drives people from this site. MM is basically a wh ore. He knows it. He is saying these things for money. He spouts the propaganda of his masters and will never be a person to have a rational discussion with. The fact is that the anti-patent judicial activists are the worst kind of people. They are the ones that are breaking our society. Just fil th. MM is basically a wh ore. He knows it. He is saying these things for money. LOL The projection is strong in this tr 0ll. Just notice below that MM is yapping about me making things up about professors writing articles for money when just a few months ago there was an article posted on here that MM obviously read about Google paying professors large sums to write articles in law journals to abstracts that Google provided. MM is obviously a paid blogger. I’m pretty sure he’s a pharma lobbyist and considers this part of his work. It would be a vast improvement if there was an ability to mute posters on this site. Get out your smelly echo chamber for a while and spend some time with some normal, decent human beings (i.e., not r@ cist mis 0gynist Re pu k k ke pieces of shirt) for a change. Or maybe those types of people are hard to find where you’re from? That would explain a lot. Ages ago, someone on these boards (I vaguely remember it being Ordinary Squirrel, but I could not swear to that) recommended a browser extension that can be installed, and which allows one to specify certain handles whose entries are then blotted out. I downloaded it and installed it, and it really improves the experience. Regrettably, I am not your most sophisticated computer user, so I cannot remember the name of the software, nor the link where one obtains it. I also do not know how to look up the identifying information. This is as much as to say, however, that if you want a “mute” function, such things are already available as a browser extension. You are probably more computer savvy than am I, so I bet you can find it if you look. Or you can just go elsewhere. I mean there are numerous blogs out there where everybody agrees about the “anti-patent” Supreme Court and how restrictions on patenting abstractions like correlations are The Worst Thing Ever. Go to them! Stay away from this one. This blog just happens to be the blog where you can get a decent idea of what is actually going on and what the best arguments are and what are the problems with the worst arguments. You know, instead of just listening to endless shrieking echo of patent maximalists who are never satisfied. Like everything else, it’s a choice that you make. Heck, if I can put up with s0ckpuppeter superstar “anon” and his br@ inde@d bff Night Wiper for fifteen years then you can put up with listening to some rock solid arguments about why you can’t protect facts, information and logic using the patent system. You have engaged in more sockpuppetry (EVEN after whining about incessantly) than anyone else for at least the last five years. You have NOT “been putting up with” anyone doing anything untoward for “fifteen years,” as the objective documentation shared on the last “let’s have a nice ecosystem” thread showed, YOU have been the blight for now just over 13 and 1/2 years. And of course, you have provided only feelings and rants – and entirely lacking in rock solid arguments – for protection of certain types of innovation. And that wouldn’t be half that bad if you could even restrain yourself to actually only posting on patent law topics (and NO, there is no such “universal” link between anything “legal” or “political” and patent law. Your attempt at any such linking is downright shamefully self-serving (albeit also entirely UNsuprising, given that you are the Trump of these boards). You are right he is John Doll. Feel free to install greasemonkey (firefox) or tampermonkey (chrome) and add this to your own userscript. iDan: Absent patents as an incentive for public disclosure, technology gets kept secret or wrapped up in burdensome contracts. This is a tired excuse for patenting anything and everything. I’m looking for an argument that progress in the “instructing computers arts” is promoted by patents. Other than a tiny handful of patent attorneys, most of the people writing software understand that software patents are worthless junk and don’t promote anything except litigation. That’s because logic — whether instructions for people or computers — belongs in the public domain. It’s a fundamental building block. So try harder, iDan. A lot harder. Congress recently amended the patent act and did nothing to abolish software patents. That is evidence of their intent. Nice try at changing the subject, iDan. We were talking about Congresss’ intent in 1952. Congress also didn’t ban patents on new robots which look and feel identical to “cute” little 10 year old girls and boys but lack emotions. According to your deep reasoning, is that evidence of Congress’ intent to promote progress in that area with patents? C’mon. Step it up, please. Do I need to hold your hand and walk you through the sordid history of logic patenting? P . U. That is an incredibly junky claim which I would have no problem recommending to any client: infringe away! It’s not my problem that Blue Coat’s attorneys kinda s u ck at this stuff. More importantly, there is certainly a transformation of data in that claim or, if you want to really play philosophical games, there is a transformation of some machine, somewhere, because the machine has to be “transformed” in order to transmit or store the “new” data. Now excuse me while I take a shower to wash off the stench of that bit of advocacy in the maximalist’s stinky@ss shoes. Hey, everybody, Mal agrees that software that transforms data should be patent eligible! Well, guess my work here is done. iDan Mal agrees that software that transforms data should be patent eligible! By now you should understand, iDan, that if I want to state my opinion about something, I just do it. I don’t beat around the bush. I am also aware of the popular rhetorical tactic (among maximalists) of avoiding any attempt to understand what your opponent is saying and instead running off into the weeds with the goalpost and everything else while putting words in the other person’s mouth. I’m crystal clear about this: transformations of data aren’t eligible for patenting. But they are transformations. This is one of the problems with the classic “machine or transformation” test. That problem is one of the reasons that a prohibition on protecting abstractions is a far better test. The fact that a tiny tiny class of well-heeled entitled attorneys has decided to collectively stick their heads in the sand and declare that it’s impossible to understand what “abstract” means or how to determine whether a claim is improperly protecting that “abstraction” is an annoying fact but it’s hardly an insurmountable one. It’s easily surmounted. All it requires is for the Supreme Court to pick up the baseball bat with my clear-as-crystal description of what constitutes an eligible machine/composition and/or an eligible process engraved on the handle, and start whupping behinds with it. Corrected for Malcolm’s number one meme of Accuse Others Of That Which Malcolm Does. starting from the fundamental unambiguous and non-controversial principles of eligibility case law, why is that claim going to be found eligible, 9-0, by the Supreme Court? Explain how the Supreme Court finds Finjan’s junk claim to be eligible in a 9-0 decision. Spare me the mealy-mouthed mewling re Thomas. I want to hear your solid argument, starting from the fundamentals, that a claim to logic carried out by a computer must be eligible for patenting because [insert your awesome argument here]. If you don’t have such an argument, just admit it. I mean, you aren’t f 00 ling anybody except yourself and the low-renters here (“anon”, etc). Maybe you just love Kool-aid. Lots of children do. Maybe you just like being a privileged person enjoying your entitlement and special exceptions. You aren’t alone there, either. Lots of rich white men in that category to keep you company. Because I know what I’m talking about and I’m ahead of the curve by about five years and I’m not a chickenshirt when it comes to pulling the pants down on the most entitled attorneys who ever walked the earth. That’s the reason. Deal with it, crybaby. Says the biggest crybaby on the site — bar none. As a software arts examiner, the vast majority of the applications I see do not achieve this. These applications either disclose a front end which could not be hidden, or they claim a back end as a black box. This seems to be particularly a problem with software. “And at 5.1.2.2.1, Mal posted with spittle flecks over his keyboard: … And Dennis, this is the type of behavior that drives people from this site. Rather than asking for Dennis to solve the problem, as a group we should take the matter in our own hands and just refuse to engage. Trolls live for engagement, and our silence will be far more effective against the Big-Three (Or Two. Or One. However you see it) than any IP-ban could be. Well said. For whatever little my opinion is worth on this point, I heartily endorse. Learning to ignore is easier than you might think, and it is doubly easy with the right software to blot out entries posted under specific handles. As a special bonus, installing that software cuts down the substance-less food fights that one must scroll past to get to the real discussion. “real discussions” are not those that you merely deign to engage in, Greg. All too often, you run from discussions in which the only “affront” is that your desired viewpoint will not come out on top. All too often, you run from discussions in which the only “affront” is that your desired viewpoint will not come out on top. The funny thing is, the patent site that best controls for such propaganda is the one that Malcolm 0bsesses over. Bottom line is that the editors DO control the narrative and have Means (but do not engage those means on an objective, apply-the-rules-evenly basis. Nothing wrong with repeating a good argument that nobody is challenging. That’s the thing about good arguments: they are really hard to challenge! That’s not what happens here — especially with you — and in fact, you are infamous** for your drive-by monologue style. **and yes, before you attempt to twist what someone else says (again), take note that the “in” is NOT a compliment for you. Ben, you seem to feel you know what you talking about with pretty much everything. But have you ever created a real product. Funded a real product. Dealt with copiers. Had to take features from other products to compete. Etc. My guess is that you know pretty much nothing about the real world and are soaked in the arrogance of the CAFC and SCOTUS. >PROBLEM — Although there is probably a way to salvage this invention on eligibility grounds, the PTAB is clearly wrong that “DWELL TIME” is an internet specific phenom. Apparently, none of these PTAB judges have worked in retail sales. This is a ridiculous comment. If you feel that way Dennis, then please make a real attempt at analogizing the two. Or do you feel it sufficient to make vague reference to Pharaohs and abacuses? For one thing the presentation of information on the web is completely different than in any bricks and mortar store and measuring a potential customer’s behavior on a web browser is not the same as whatever metrics may have been taken 30 years ago or 3,000 (if you are Breyer). Because in Night Wiper’s imaginary world bricks and mortar stores haven’t been presenting customers with info about products for sale and displayed on flat 2D sheets of paper since forever. For cripessake, technology for tracking eyeball movements over displayed information was old even in the early 70s. Also you just gotta love how presenting products on the Web and presenting them in “brick and mortar” stores is “completely different” on Thursday … but on Tuesday we’ll here about how constructing a spreadsheet is “no different” than building a house out of bricks and mortar. Funny how that works. The fact of the matter is that these two things, i.e., (1) measuring the amount of time that a user spends looking at a product on a shelf, AND (2) measuring the amount of time a user spends looking at something on a screen, are both ineligible methods. Making a ranked list of the names of the products based on the time length is also ineligible. It doesn’t matter whether the store is made of bricks or straw or pixels. And it doesn’t matter whether the products are DVDs, potential mates, or steak thins (TM). These are ineligible methods. I don’t even consider a conversation about whether something is abstract in view of Alice to be a proper conversation. Just read MM’s post. It all turns on: sniff, I like it; or sniff, I don’t like it. The fact is that fundamental to patent law is the elements of the claims taken as a whole. Put together a 103 argument if you feel it is a bad claim and stop the lawless invalidation of claims. See post number one below. If an applicant is specific in its aim and delineates the scope of its efforts to be a computing-centric scope, the notion that non-computing parallels may exist is of no consequence. The whole impetus of the innovation simply is not to any and all parallels, but falls directly to the chosen computing-centric issue. There is a vast difference between “do it on a computer” when “doing it” is meant to resolve the scope beyond the computer and when “doing it” has been identified as a computing issue being aimed at to be resolved. In the latter, any scope of claims (read by a Person Having Ordinary Skill In The Art, necessarily informed by the specification) would BE “directed to” a computing-centric issue. Further, even though the Supreme Court has ursuped the role of just who gets to do this determining of “directed to,” Congress HAS delegated this responsibility/power to a particular entity: see 35 USC 112. The applicant tells others what the scope of the innovation is to be understood to be. Notably (and a point worth emphasizing given the dust kicking already seen here), this is NOT the same as the applicant attempting to use some type of “magic words” of “my innovation is limited to whatever the Courts deem ** to be passing 35 USC 101.” Instead, and again, through the power of 112, the setting of scope has long been within the realm of the innovator. **interestingly enough, applying such a caveat results in violation of 35 USC 112 given the lack of certainty in the unsettled ping-pong common law now being scrivened under 35 USC 101 as a direct result of the meddling by the Supreme Court. This fault only reflects the larger issue of the scoreboard being broken. In case it was too nuanced: a choice of scope of solution is different in kind from a choice of technical field within which to apply a scope of solution. I also think that Dennis should not support Alice and make a public denouncement of Alice one of the decisions that is delegitimizing the Scotus. Already some of have said that we are getting close to a time when the Scotus is going to rule on an issue and it will not be followed. This is no surprise given opinions like Alice. Alice should be expressly reversed as unconstitutional. This would be a good step towards repairing the trust of the patent bar with the Scotus. I also think that Dennis should not support Alice and make a public denouncement of Alice one of the decisions that is delegitimizing the Scotus. Since academia is just one big payola sc@m according to you, why not just pay Dennis to make that statement? You could even get some friends together or start a GoFundMe page. Very very serious stuff! So you missed the study that was posted about Google writing abstracts and then paying professors to write articles to the abstracts. The pay was up to $50K. You are right, though, that I’d bet if I write some abstracts that plenty of the wh ore professors would line up and write law journal articles to the abstract for $50K. Just admit it MM. You are basically a who re. You don’t care about the means only the ends. That makes you the worst kind of human being on the planet. No, no, no. That is very silly. It’s as silly as my suggestion to the bootstrapping maximalists who want to “ban” claim dissection to put the words “wherein said method is enabled and non-obvious” in the claim. Then everytime an Examiner says your claim is not enabled you simply reply “Wrong! Read “as a whole”, my claim requires that the method is enabled.” Rinse. Recycle. Repeat. Remember this silliness the next time a maximalists pretends that parsing claim elements out in order to understand the relationship of the claim to the prior art is somehow forbidden. Because it’s not forbidden. On the contrary, it’s logically and reasonably required in most cases and it’s incredibly silly to suggest otherwise. (news flash: the maximalists will keep on playing the game anyway because, well, it’s all they got). Could be a “tag”. Could be a happy birthday wish to your M0 mmy. Could be something else. It’s whatever I want it to be. This is (another) one of the huge problems for the software patentistas. A court can create, out of thin air, some mystical magical way to distinguish the “good” fake “structure” from the “bad” fake “structure” but the “structure” is still fake. The only thing is that the fake “structure” will be “supported” (virtually) by some abstract “test” concocted by a court that is unwilling to face reality. Quite a system, huh? There are no objective physical structures associated with those terms. Are you trying to bring back the machine-or-transformation test? For whatever little my opinion is worth, I would love to bring back the MoT test. Of course, the problem is that the MoT never completely left. Back when CAFC Bilski enshrined it as the test, one could know where one stands. If a claim passed MoT, then it was eligible. If a claim failed, then it was ineligible. Nice. Clean. Simple. Now that MoT has been demoted from the test to merely “a useful clue,” one has all of the downside of MoT, but none of the upside. If one fails MoT, then one knows the claim to be ineligible. However, if one passes MoT, what does that mean? Who knows? Give me a nice, clear, bright-line rule like MoT. That would be much more consistent with rule-of-law than the “I know it when I see it” standard that presently prevails. Actually, closer to the opposite. For someone to try to elevate it as an attempt to eliminate, that is an improper elevation into BEING a test (as opposed to being a clue). Malcolm’s quip may be taken in one of two ways – and BOTH are wrong. In the way that you are taking, a clue is simply not a test, and thus, NOT passing it is not probative. The other way of taking Malcolm’s comment is that he attempts to elevate an optional claim format (“objective physical structure”) somehow into being a NON-optional claim format. A clue is not dispositive. Feel free to continue to try to dissemble around that, as you attempt to hold onto one of the items from the CAFC level Bilski decision that was thrown out 9-0 by your favorite Court. If one fails MoT, then one knows the claim to be ineligible. The Court of Appeals incorrectly concluded that this Court has endorsed the machine-or-transformation test as the exclusive test. It is true that Cochrane v. Deener, 94 U. S. 780, 788 (1877), explained that a “process” is “an act, or a series of acts, performed upon the subject-matter to be transformed and reduced to a different state or thing.” More recent cases, however, have rejected the broad implications of this dictum; and, in all events, later authority shows that it was not intended to be an exhaustive or exclusive test. Gottschalk v. Benson, 409 U. S. 63, 70 (1972), noted that “[t]ransformation and reduction of an article ‘to a different state or thing’ is the clue to the patentability of a process claim that does not include particular machines.” At the same time, it explicitly declined to “hold that no process patent could ever qualify if it did not meet [machine or transformation] requirements.” Id., at 71. Flook took a similar approach, “assum[ing] that a valid process patent may issue even if it does not meet [the machine-or-transformation test].” 437 U. S., at 588, n. 9. So, according to SCOTUS, you can theoretically fail the mot test, but still be eligible. I think that he has – his snippet of what you said is being addressed. You are just as wrong in that snippet as Malcolm is in Malcolm’s continued attempts at dissembling. Ha, my apologies. I should rather ask, did I even read your post. I misunderstood your point at first, but now that I re-read it, I see that what you write is correct. Thank you for the correction. In any event, I still stand by my more substantive point—we were closer to a real rule-of-law system in patents back when we were living under In re Bilski, 545 F.3d 943 (Fed. Cir. 2008) (en banc) than we are now under Bilski v. Kappos, 561 U.S. 593 (2010). That sort of bright-line rule is more properly law than the “I know it when I see it” mess of pottage that we have now. My fault, Greg, I should’ve been clearer that I agreed with you that the current test is an utter mess, but was just correcting that one bit on failing the mot but still being eligible. iDan according to SCOTUS, you can theoretically fail the mot test, but still be eligible. Wow! How comforting that must be. “Theoretically” you can do all kinds of specific things that the Court has never been squarely confronted with and dealt with “head on” as it were. “Theoretically” I can claim a “new” antibody merely by describing the structure of the antigen it recognizes because the Supreme Court never said that I couldn’t do that. Here’s the deal, iDan: (1) give everyone an example of a claim that does not recite a machine and that does not transform anything but that is nevertheless eligible for patent protection and (2) starting from the fundamental unambiguous and non-controversial principles of eligibility case law, why is that claim going to be found eligible, 9-0, by the Supreme Court? Because I can do the opposite easily from my side, for any claim that does nothing but manipulate data. I don’t need to make any assumptions. Another reminder: Enfish’s claims were tanked under 103 before the eligibility issue ever got to the Supremes. They would have lost. Bandai didn’t bother to appeal McRo so the Supreme’s never got to address whether a look-up Table could be protected with a patent (LOL). The issue is never going away until software patenting — at least under the current US system — is tanked. That day may come next year, or it may come in five years. But it’s surely coming. There is no “swinging back” of the pendulum. How could there be? That wouldn’t be “progress”. What we’ve had for the past several years is just a two steps forward one step back progression. Literally anybody getting into the “do it on a computer” game now has to know that they are gambling, bigtime. Because the curtain is closing. It’s always been closing, from the day it was opened wide by the CAFC in State Street. There’s no other way. Not a small difference here is that the Court has said “you can’t do that” to the thing that you want, Malcolm. The so-called “machine-or-transformation test” never really went anywhere. It’s still a test, albeit not an absolutely definitive one (unless, as Greg correctly observes, there is no structure and no transformation in the claim — then I’m pretty certain the claim is ineligible). The problem with the “machine or transformation test” as it existed prior to Bilski is the Mayo problem, i.e., you can make pretty much anything eligible for patent protection according to the pre-Bilski case law by reciting a prior art machine or a prior art transformation in addition to that “thing” (a “non-obvious” correlation, a “new” logical data processing step) you are trying to protect. The test I have been proposing for many many years now is more strict than the classic “MoT test”. My test for eligibility (not necessarily the only one, but the main one) is that the claim recite (1) non-obvious structure in objective structural terms that distinguishes the claimed composition/article from the prior art on that basis or (2) a step or combination of steps that results in a transformation of physical matter that was previously not known to occur, or that occurs in some unexpected manner. Yes, my test eliminates all claims that seek to protect computer logic as such. It doesn’t mean that a claim that recites a computer is ineligible! It does mean that there needs to be something else going on besides data processing, storage and communication of information. It’s still a test, albeit not an absolutely definitive one (unless, as Greg correctly observes, there is no structure and no transformation in the claim — then I’m pretty certain the claim is ineligible). Incorrectly. SCOTUS said exactly the opposite in Bilski. I wrote: It’s still a test, albeit not an absolutely definitive one (unless, as Greg correctly observes, there is no structure and no transformation in the claim — then I’m pretty certain the claim is ineligible). Abstract iDan responded: Incorrectly. SCOTUS said exactly the opposite in Bilski. “Exactly the opposite”? LOL Show everyone what you’re referring to, in context. Then show everyone a granted claim — just one — where there is no structure, and no transformation, that has been deemed eligible by any court. Bonus points if you can show me such a claim that was ever enforced, challenged and still found eligible. That is not the bad news. The bad news is that you nigh constantly only v0m1t the same C R P from your short list of memes as if what you say need not bother with any counterpoints presented. The bad news is that your unmitigated propaganda never engages on the merits of any actual conversation. The bad news is that you are incapable of dialogue, and that you are only capable of drive-by monologue. As it has been now for more than 13 and 1/2 years. Agreed, and that was a terrible result. I see so many claims that practitioners think are eligible, merely because they wrote ‘a computer-implemented method’. I disagree with both your goal, as well as whether that reflects SCOTUS’ explicit statements that passing mot wasn’t a requirement, or Congress’ intent in including processes as patentable in the first place. You’re entitled to disagree. Would you care to explain to everyone why you disagree? You must have thought about that for a few minutes. I hope. The SCOTUS has never addressed the question as to whether the patenting of logic — which is ineligible (try it, and you’ll find out the hard way) — becomes eligible subject matter when the logic is carried out by a prior art programmable computing machine whose sole purpose is to … apply patent-ineligible logic processes on data. The issue has never been squarely presented to the Supremes. But here’s the guarantee: if a good lawyer presents the issue, it’s all over for software patenting except for the whining and crying. There’s no way around it except for the Supremes to create a special exception out of thin air that takes subject matter out of the public domain rather than putting it in. The Supreme Court has never done that. They’re not that st0 0 pit. At least, they weren’t in the past. But now we’ve got some genuine ivy league t 0 ilet people on the Court so who knows. or Congress’ intent in including processes as patentable in the first place. Congress never intended to make logic processes applied to data eligible for patenting. That would have been a wildly radical change in the law. Basic doctrines of statutory construction destroy that possibility, which is why we have the judicial exceptions in the first place. Please step up the game, iDan. I’m getting b0red. That’s not “stepping up” that you are looking for. The anti-patent judicial activists are just a revolting group of people. …and its not even a “good” new witch word at that. Way back when he first started trying to dissemble with his new witch word I pointed out that software claims COULD BE written in that very same “objective physical structure” optional claim format that he whines for. Of course, such actual claims (for example, any type of description of a medium upon which a software claim may be transcribed) would be tens to hundreds of pages long of “objective physical structure,” would NOT be readily understood by anyone reading the claim (think of such things as his quips of “00010111011100111,” but in objective physical structure terms), would be a literal nightmare to try to examine (not that he actually cares about such things), and would STILL carry all the force of the current other optional claim formats (because of the patent doctrine of equivalency). IF he “got” what he whines about incessantly, the only guarantee is that he would continue to whine! the [claims] appear to simply be claiming the abstract idea of ranking items based on human interactions with them. Right. And that’s a quintessential example of an ineligible abstraction: data sorting for the sake of data sorting. The mere recitation of a prior art computing context (or any other context), e.g., “on a computer” or “on the Internet”, regardless of what words (or how many words) are used to describe that prior art computing context (e.g., “remote servers”, “wireless”, etc) can never suffice to render such an abstraction protectable. Contrary to a comment below, the case law — when considered as a whole — is actually crystal clear on this point. Where there is some (unnecessary) confusion it’s confusion about what additional subject matter would suffice to protect that abstract subject matter in a particular context. One crystal clear answer is that a novel and non-obvious context described in objective structural terms distinguishing that context from the prior art context would suffice, beyond doubt. Unfortunately, for well-known reasons, that answer — while unambiguous — is deeply unsatisfactory for a tiny, tiny class of patent seekers who insist that they are entitled to make big money off “the Internet” by pursuing g@r b@ge patent claims like this one. As Dennis seems to understand, there is so much wrong with this PTAB decision it’s difficult to know where to begin. Probably not even worth beginning because this patent will be obliterated soon enough (unless it’s never enforced). But the magic word of the week is “dwell time”! I can hear the super serious partners at patent group meetings around the country instructing their underlings to update their specifications immediately. Good luck with that, boys. I wrote: The mere recitation of a prior art computing context (or any other context), e.g., “on a computer” or “on the Internet”, regardless of what words (or how many words) are used to describe that prior art computing context (e.g., “remote servers”, “wireless”, etc) can never suffice to render such an abstraction protectable. And it’s also worth remembering that content descriptors of the data also do not change this result (e.g., descriptors like “available real estate”, “hyperdynamic retention values”, “virtual bingo tokens”, “attraction scores”, etc.). First of all, the amount of time I spend on an ebay page is more related to how clear the page is that it is to a likelihood of purchase. If its clear, I’m likely to spend less time looking for the information I want about the product, the shipping cost and shipping time. Second of all, lets say that there were some relationship, or dare I say correlation between dwell time and purchase rate, so what? What do you do with that information? Make the page load slower? Add nudes? Add a Sudoku section? Is that really going to increase sales? Second of all, lets say that there were some relationship, or dare I say correlation between dwell time and purchase rate, so what? What do you do with that information? From a quick skim through the application, I believe their intent is to measure dwell time on pages, aggregate those measurements from a whole bunch of users into averages per page, and rank the pages in order. Then, when selecting a new page for “suggested” items, they can choose proportionally from the longest-dwelled pages. Basically, avoiding recommending the items that no one spends time looking at, and recommending the ones that people do. Well, why not just use purchase history? Whats the point of using dwell time as a proxy? Better reach for potential customers. If you just rely on purchase history, then you may under estimate customer interest in other items. Like, say you’ve got a product that’s just a wee bit too expensive, so purchase history is very low, but you have lots and lots of interest in it. If you just go by purchase history, it would have a low rank and you’d never show it as a suggested item to other customers. But by using dwell time as a proxy for interest, you may end up showing it often to lots of people, a few of whom may decide to splurge or save up for it and purchase it. That’s an argument for using dwell time. That argument is unrelated to this claim language: “and the dwell time associated with a likelihood of a transaction occurring with respect to the listing;” and discounts the importance of the figure posted in the article. The x and y axis lack units which is part of the s@dness of this cr @p Figure. But you’re a very serious person, Les! Tell us about the Wright Brothers again, like the good old days. How could you ever prove this claim limitation in an alleged infringing use? How could you show that in a given instance, how long someone looks at something is associated with a likelihood they will buy something? All you know at the end is they either bought the item or not. It’s not my area of expertise, but I think this actually has been really well studied by marketing people. OTOH, it’s been really well studied for decades, if not hundreds of years, so there’s nothing particularly new about it. Statistics study things in aggregate. In aggregate, dwell time may be correlated with likelihood to buy. But for infringement, you have to show that *in a specific situation*, the dwell time was correlated with a likelihood of something happening. In a specific situation, someone either buys something or they dont. You never actually know the “likelihood” that someone will buy something in a certain instance. You can only make that inference by looking at aggregate data, and then infringement goes out of the window. I do not think that the claim is written for the “specific buyer” as infringer. Your infringment theory, while interesting, is not in play. Dwell time is really just a proxy for purchase likelihood. The idea is 1) determine purchase likelihood based on X, and 2) sort products based on the determination, where in this case, X is a “dwell time”. The idea is 1) determine purchase likelihood based on X, and 2) sort products based on the determination, where in this case, X is a “dwell time”. To be more accurate (and it’s important here), it’s not the products that are being sorted. It’s the names of the products that are being sorted. Pure vapor. And a helpful reminder: in every claim where data processing is involved, there is an eligibility issue. That’s because data processing is different from processing tangible materials. How is it different? Well, for starters data processing is ineligible on its own terms, as everybody has understood from the beginning of our patent system (also true in every patent system around the world). Sorting stuff in a table is ineligible for patent protection. Doesn’t matter if the resulting table is “non-obvious” or if the table is worth ten zillion dollars. That’s not ineligible. As to why such abstractions should suddenly become eligible for protection merely because a programmable computer (as opposed to another prior art tool like a calculator or a pencil and paper) is used to carry out the sorting, that’s only because the CAFC created a mythological foundation, pulled out of thin air, which states that stored data (at least stored data on a computer) is the “essence of electronic structure.” Never mind that the alleged “electronic structure” of this “essence” is never, ever recited in the software patent claim (there’s a reason for that!). The CAFC just handed out a gift and, as we’ve seen, questioning the legality of that gift is tantamount (in some circles) to questioning the desirability of computers or technological progress itself (yes, it’s a very odd reaction but some people are deeply, deeply invested in this gift — and pretty all of them are pretty well off even without the gifted entitlement). Self-correction here: Doesn’t matter if the resulting table is “non-obvious” or if the table is worth ten zillion dollars. That’s not ineligible. Although there is probably a way to salvage this invention on eligibility grounds, the PTAB is clearly wrong that “DWELL TIME” is an internet specific phenom. Apparently, none of these PTAB judges have worked in retail sales. Though that’s true, it’s still a bit different in an internet environment: while your retail clerk can stand there and watch someone rummaging through a pile of jeans, that doesn’t directly analogize to server-side and client-side operations. Specifically, the client requests a web page, and the server delivers the page, and… then what? No additional communications are flying back and forth, unless there’s something additional there. The server can’t tell the difference between a user poring over that page for an hour or someone who immediately closed the page and loaded a cat video on YouTube. So, maybe you’ve got a client-side script that’s running a timer and sends a value before the page is exited or closed. The analogy would be having your retail customer start a stopwatch when they enter your store and then shout out the value to the blindfolded clerk before they leave, which probably doesn’t occur that much. Or maybe you make them shout “I’m still here” once a second, but that doesn’t scale well with thousands of customers. Or maybe you maintain a page state for the client device on the server with a delivery time, and then attempt to infer dwell time based on when they receive a linked page from the server, though that doesn’t address closing the browser. Anyway, there’s lots of various implementations on how to determine dwell time that come up in an internet context, but wouldn’t come up in real life. OTOH, the application here is silent on what those implementations are or what they’ve used. Instead, they appear to simply be claiming the abstract idea of ranking items based on human interactions with them. I think this decision was wrong – while they’re right that this is directed to a problem that’s rooted in computer technology, that alone is not the test for whether a claim is directed to an abstract idea. The claim doesn’t recite an implementation of a solution to the problem, just the problem itself. I think that you are right about this, but I wish the case law were more clear on this point. If the PTAB is mistaken in this judgment (and, as I said, I think that you are correct to say that they are), then it is a very forgivable error. The CAFC has left a regrettable intimation in places that something is not an “abstract idea” if the problem itself is rooted in computers. Abstract iDan is not correctly reading the existing case law (nor the newly revised MPEP). That wouldn’t pass under step 2A either. No. That is your added words – I suggest that you check out the actual words. The secondary items from the MPEP are just that: secondary items. See the Malcolm quip as to Enfish: link to patentlyo.com (and my counterpoint). What do you mean by this? We’re still talking about 2A, not 2B. Aw, geez, you summoned him. The CAFC has left a regrettable intimation in places that something is not an “abstract idea” if the problem itself is rooted in computers. SAP’s claims were certainly directed to computers. Heck, so were Flook’s and Benson’s. I think they’re trying to pull that back. Agreed, although based on the compositions of different panels, this effort is proceeding in a herky-jerky two-steps-forward-one-step-back manner. I would welcome a few more en banc cases to iron out the self-contradictions in the CAFC’s post-Alice jurisprudence. I would only point out the obvious: this is a direct result of the Supreme Court scrivinings. You are trying TOO HARD to make sense of the ping-pong game going on, as InvestPic is not compatible with other panel decisions. bottom line there is that the CAFC is NOT controlling itself from one panel decision to the next (for example, you imply :specificity, but as Malcolm will remind you, specificity cannot salvage you from abstractness). As to Benson and Flook, see Diehr – and Bilski, which states that Diehr cabined Benson and Flook. – even though THAT now appears to have been caught up in the Gordian Knot of Supreme Court nonsense. Resorting to “case law” will NOT show clarity. Can you say Void for Vagueness? Diehr stands for the proposition that the eligility determination requires more than just pointing to an element in a claim that could be deemed eligible or ineligible on its own terms (i.e., outside of the context of the claim). Asked and answered – MANY times now. Right, but what is that “limitation on the principles”? What did (this dicta) in Bilski actually say? Could it be that the innovation itself is directed to ONLY the internet specific aspects of the phenom (thereby, separating the phenom into more than one thing, and not being “directed to” the different larger context of non-internet aspects? Is not the Office constrained to view the innovation AS the patentee has provided in her specification? (granted, here, I have not actually viewed this specification, and this legal reasoning may — or may not — apply to this particular case). LOL – I “get” your reply (and oddly have seen that in some NON-pro se applications my firm has inherited), but my point is NOT at the level that you would jest. My point is a legitimate one, one in which the Courts have indicated that the scope of what the innovation is directed to is controlled by the applicant. If the applicant is only addressing internet-centric effects – and clearly states so, then the Office cannot purposefully get the scope of the application wrong, just in order to reach a “desired” 101 position. See also the Robert Bahr memorandum on determining proper scope of the application prior to applying any 101 analysis. Were there also “limitations” reciting “wherein said method is non-obvious and enabled”? Not kidding. Wasn’t in a claim, but it was right there in the specification.